Ornamental demesne with wonderful rhododendrons, azaleas and walled garden. Rowallane is at its most glorious in spring and autumn, thanks to the display of rhododendrons and azaleas and the final blaze of glory of ornamental trees and shrubs, but it is a lovely place at any time of year. The 52 acre demesne near the old linen town of Saintfield was first enhanced by the Rev John Moore, who laid out the pleasure grounds and was responsible for the curious stone cairns like pyramids of Ferrer Rocher. 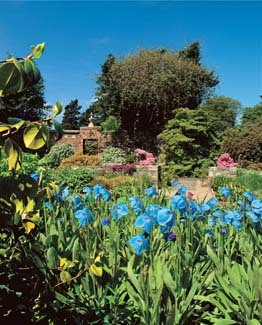 His nephew, Hugh Armytage Moore, planted the collection of rhododendrons, magnolias and flowering shrubs: this is gardening with nature on a grand scale, shrubs and trees many from China and Chile - are planted in the Robinsonian manner, along informal paths in an area known as the Spring Ground. Each area in the wild garden is linked by grassy paths and has its own special atmosphere: there is the mysterious Bishop’s Rock, and the Hospital, where sick calves were grazed. The earliest rhododendrons bloom in December and the display of blossom reaches a peak in May with a colour range running from deepest red like R sanguineumthrough purples, blue and yellow, to the creamy bells of R falconeri. But there are fascinating trees and shrubs to be seen here at any time, the brilliant autumn colours of prunus, sorbus and acers like A palmatumvar heptalobum, the summer displays of the fluttering bracts of the handerchief tree and the white flowers of stuartia with their golden crowns of stamens. There is a bandstand where The Rev Moore sometimes used to preach to his flock, and also a wild flower meadow and a lake waiting to be discovered. The walled garden with the National Penstemon Collection is worth a visit in its own right (there are over 50 varieties). 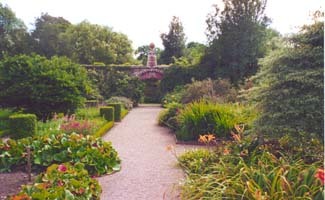 Beside the arched gateway there is a silver and blue garden and although the grid of paths is formal the planting is eclectic, with a mix of shrubs, trees, bulbs and herbaceous plants. There are unexpected carpets of the autumn crocus, corners where Southern hemisphere plants like agapanthus varieties flourish - and, among the more spectacular sights to be seen, are the summer displays of snowy hoheria flowers, drifts of azure meconopsis in the shady borders and showy magnolias. There are some cultivars which are special to Rowallane, Viburnum plicatum ‘Rowallane’ and a primula romantically named ‘Rowallane Rose’. Rowallane is now the headquarters of the National Trust. Just outside Saintfield on the A7 Belfast to Downpatrick Road.